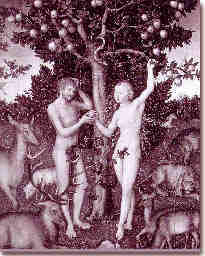 SINS - Tribunal Hands Down Surprise Ruling in Eden Case; Adam, Eve and Serpent All Exonerated! Tribunal Hands Down Surprise Ruling in Eden Case Adam, Eve, and Serpent All Exonerated! Despite centuries of efforts by his deputies to cover up the story, God was really the bad guy in the Garden of Eden case, according to informed sources close to a special tribunal whose findings will be officially released before the end of the year. The tribunal was convened last year to resolve the question of whether the descendents of Adam and Eve should still be held accountable for their so-called "original sin." Till now, the existence of the tribunal has been kept secret because of concerns that members would be subject to undue pressure and/or threats of eternal damnation if their identities were to become public. "The tribunal has carefully considered all sides of the age-old case, taking into account not only the actions of Adam and Eve but also the role of the serpent and of God Himself," said the source. "In the end, the facts just spoke for themselves," the source said. It is not yet known whether God will face charges for his role in the affair, or if he can even be located. Rumors of his death have surfaced repeatedly over the past couple of centuries, and the tribunal has been unable to locate anyone alive who has actually seen him. "Thank God!" Gives Way to "Thank the Serpent!"